Police are investigating after a woman was attacked while walking the Great Western Trail in suburban Villa Park. 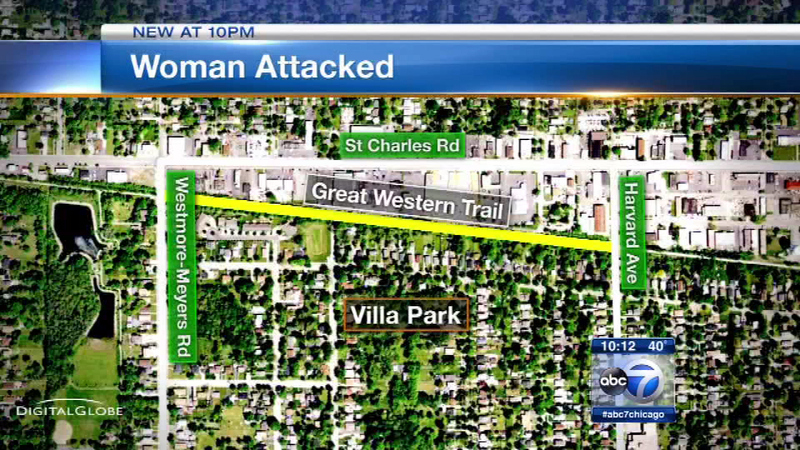 VILLA PARK, Ill. (WLS) -- Police are investigating after a woman was attacked while walking the Great Western Trail in suburban Villa Park. The woman told police she was walking between Harvard and Westmore streets around 7:40 a.m. Wednesday when a man hit her from behind then ran off. She was not robbed. Police described the suspect as a man with blonde hair between the ages of 21-25. He has a thin build, is 5'8", and was wearing a black hooded sweatshirt. Anyone with information is asked to contact Villa Park police at 630-592-6112.